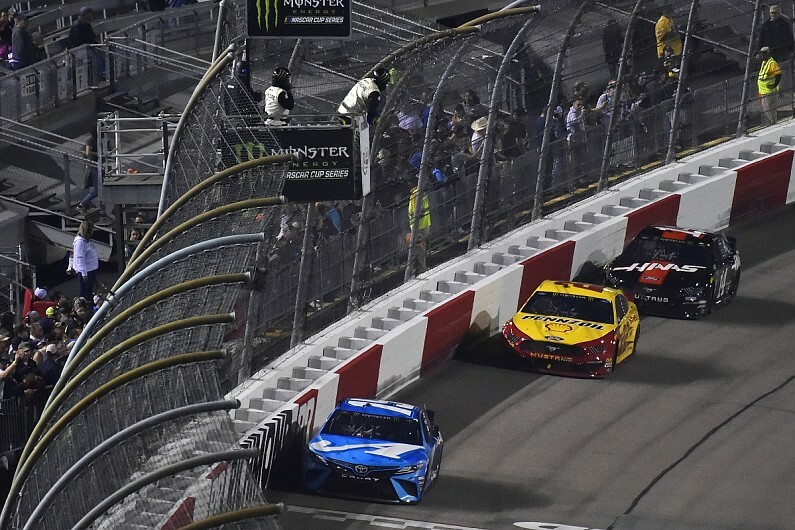 Martin Truex Jr prevailed in a late-race shootout with Joey Logano and Clint Bowyer to finally take his first short track win in the NASCAR Cup Series at Richmond. The result was also a first win for 2017 champion Truex since he joined Joe Gibbs Racing at the end of last season following the closure of the Furniture Row squad with which he had won the title. Truex hadn't won a short track Cup race in 80 previous attempts, but had led more laps at short tracks than any other driver without a win at one. Truex had to resist Bowyer for the deciding 70 laps and although Bowyer's Ford performed much better in traffic, Truex was able to remain out in front as Bowyer faded in the final laps of the race. Stage two winner Logano mounted a late challenge on Bowyer for second, and was able to get by with three laps left as the Stewart-Haas driver overworked his tyres and brushed a wall in the final 15 laps. Polesitter Kevin Harvick was fourth, ahead of Denny Hamlin - who was the highest finisher of those that started at the rear of the field after failing pre-race technical inspection. Austin Dillon took his best finish of the season in sixth. Brad Keselowski finished seventh, despite leading 31 out of 400 laps. With his brakes running hot he was unable to keep pace with the race leaders in the final stage. Keselowski was still able to hold off Kyle Busch. The points leader won the first stage and led 101 laps but was hit with a pitlane speeding penalty during a caution period in the second stage. It took Busch just 80 laps to return to the top 10 but, despite having a fast car, he wasn't able to make his way through traffic to regain the lead. Ryan Newman finished ninth, with Paul Menard 10th. The Wood Brothers Racing driver had a strong race, running in the top 10 for much of the night. Jimmie Johnson, who will be running the Boston Marathon on Monday, was 12th, beating Hendrick team-mate William Byron and Erik Jones - who lost a front-row starting spot due to his own pre-race inspection failure. Daniel Suarez, another victim of pre-race discrepancies, had a strong race, climbing from 33rd to 10th in just 90 laps. He ran in the top 10 for much of the night but a pitlane speeding penalty during the stage three green flag pitstop cycle ended his hopes of a strong finish. Other than the stage ending cautions and a lap 40 competition caution attributed to overnight rain, there were two yellows. The first was caused by Kyle Larson hitting the Turn 1 wall on lap 128 after his left rear tyre went down. The second came when Michael McDowell had a similar hit in the same place, albeit caused by his right rear tyre deflating.